One of the major obstacles to providing quality services, fighting corruption and reinforcing the rights and freedom of expression in the Kurdistan Region of Iraq (KRI) has been political divisions and disputes between political parties. Since the uprising against Saddam’s regime in 1991, Iraqi Kurdistan was later to become a de facto autonomous region. The advantages afforded by this unique situation could have been invested more astutely in pursuit of economic development and strengthening the Region’s infrastructure. The KRI was able to fill the void resulting from administrative withdrawal of the institutions by Saddam’s regime after 1991 through conducting national elections and forming its first elected parliament. The subsequent formation of the first regional government looked to be a step toward an independent state. However, since then the KRG’s ability to provide services has not progressed due to the exclusive concentration of power in the hands of the Kurdistan Democratic Party (PDK) and the Patriotic Union of Kurdistan (PUK). The results of the disputes between both political parties over power led to their hegemony over all economic activity, which slowed down development and the effectiveness of service delivery, as well as discouraging private sector investment. This situation also weakened the role of institutions. The internal fighting led to the establishment of geopolitical divisions within the region: the Yellow Zone under the PDK and the Green Zone under the PUK. Political rule and service provision varied in each zone at different times. This internal division has led to considerable instability within the Kurdistan Region throughout the last three decades. After 2003, the region experienced an economic boom, and the stability contributed toward attracting investment projects from elsewhere in Iraq, along with from neighbouring countries and worldwide. Politically, a genuine pluralism was established and new – mostly opposition – parties emerged. By 2010, the political system started to establish a system of checks and balances and a coalition government was formed including 5 political parties, along with representatives of minority groups. Masoud Barzani (the former president of the region)’s decision to hold a referendum for independence deepened existing divisions and negatively affected state–society relations, widening the gap between the government and the public. This decision was made on the back of accumulated internal political disputes between Kurdish political parties, widespread corruption and remaining unsolved social and economic challenges. On the other hand, the tensions between the KRG and the central government in Baghdad over the delays in paying KRG’s share of the budget, and the unilateral exportation of oil by the KRG, added more complications in terms of development and service provision and was considered another setback for public trust in democracy. One of the most prominent challenges which the KRG has been unable to overcome is poor service delivery to people, specifically the electricity power crisis. The region still suffers from a lack of electricity power despite international support, the establishment of more power plants and the diversification of energy sources, from dams to plants run on fuel and/or natural gas. It is worth mentioning that the region is rich in such resources. This political division has also created a fertile environment for lack of transparency, especially within the government institutions that are responsible for providing daily services to the public such as housing, municipal services and natural resource distribution. Corruption is the major obstacle to development and provision of satisfactory service delivery methodologies. Although efforts towards reform have been initiated, the results are still unclear, leading to further loss of public trust. The period following the controversial 25 September 2017 referendum has had enormous repercussions on economic, political, governance and public service levels. The loss of around 50 percent of the land in the disputed areas (previously controlled by the KRG after the Iraqi military units stationed there surrendered to ISIS in 2014) and therefore the loss of almost 50 percent of the KRI’s income caused severe shortages in the annual budget. The problems resulting from the referendum led to increased protest in different forms, demonstrating that the ability of the KRG to respond to its citizens’ needs shrunk as the political scene further divided. The education system continues to suffer as schoolteachers are on strike demanding their wages are paid. 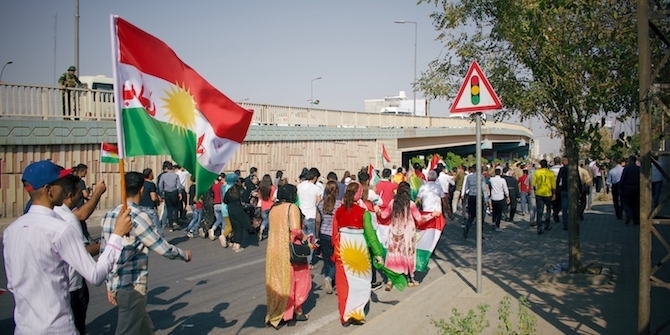 Unfortunately, the KRG chose to confront protesters with violence in the Green Zone, prohibiting the very right to protest in the Yellow Zone and in some cases simply neglecting protesters’ demands. Rates of emigration have increased markedly since 2014. Hundreds of people in the KRI have fled to seek asylum in Europe, and to a lesser extent in the USA, Canada and Australia, looking for security, stability and employment. This has led to a loss of the labour force and human resources needed to contribute to rebuilding the region. The state–society relationship has been deeply damaged. To restore public trust, efforts on an institutional (macro) level as well as a grassroots (micro) level are needed. Leaders, politicians and decision-makers will need to revise their approaches to public policy to allow for a wider space for freedom of expression, in addition to improving the mechanisms of participation in the decision-making process, to extend access past the elite minority. At the same time, the role of CSOs and individuals is crucial and needs to be complementary to that of the institutions. Allocating adequate resources for health, education and other service sectors and ensuring the quality of such services should be prioritised. Such a strategy will enable institutions to regain public trust. There is a need to maintain and build on the positive initiatives that were taken by the KRG in its 2016 reform plan (detailed in the World Bank’s “Economy For Shared Prosperity and Protecting the Vulnerable”) and the adoption of the Anti-Corruption Strategy in 2017 that was supported by the Westminster Foundation for Democracy (WFD), aimed at promoting transparency and accountability in the public sector. These are promising and positive steps towards addressing key challenges and gaining public trust through fighting or eliminating corruption. These plans will need to be followed through and implemented effectively within the agreed timelines. Impartiality of media is another important key to solidify the concept of public trust. Media is one element that is affected by political struggles and this had led to an attempt to steer public opinion based on the attitudes of political parties, resulting in the media becoming a tool to widen divisions within society. The KRG must revise its approach in planning for economic and developmental growth and also in designing the budget. Empowering local councils will enable the KRG to reshape its plans and strategies in providing appropriate and sufficient services that fulfil people’s needs and requirements. Consequently, the KRI has fertile ground that can be built on and more resources than one might think to enable its progress towards good governance, accountability, transparency and greater citizen participation for improved service delivery.